Just as some firefighters and relatives of those killed on Sept. 11, 2001, don't want Rudolph Giuliani giving a reading at today's Ground Zero ceremony, the man who would be Churchill is in danger of becoming persona non grata within his own ethnicity. 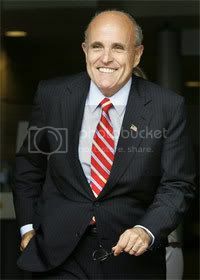 Despite a distinguished career as a crime-busting federal prosecutor (in the great Roman classical tradition of jurisprudential excellence), two terms as mayor of the country's most heavily Italian-American city and a lifelong admiration for his predecessor Fiorello LaGuardia, Giuliani has turned his back on his Italian roots. Giuliani plays the dumbed-down-Italian card with gusto. While campaigning on the West Coast earlier this year, "America's mayor" began a speech in the raspy cadence of don Vito Corleone: "Thank youse all very much for invitin' me here tuh-day, to this meeting of the families from different parts'a California." Is this political theater, ethnic self-loathing or both? Whatever the reason - his heart or his handlers - it is self-defeating. In a nation with nearly 25 million Americans of Italian descent - many of whom are swing voters in the battleground states of Ohio, Florida, Michigan, Illinois and California - why risk alienating such a pivotal constituency? In the Northeastern states of New York, New Jersey, Connecticut and Rhode Island, the scions of Italy comprise 15 percent of the population. Perhaps Giuliani feels he can take Italian-American voters for granted by virtue of the tell-tale vowel at the end of his surname. But why trifle with the country's fourth-largest white ethnic group? On what position paper is it written that Giuliani must wallow in the muck and mire of Mafia mythos? Why can't he identify himself as a proud Italian in the same manner that Ronald W. Reagan and John F. Kennedy jauntily called themselves Irishmen? Michael Dukakis invoked the ideals of ancient Athens throughout his presidential campaign. Why can't Giuliani speak of his Italian origins, and of America's debt to his noble ancestors in the Roman republic that is the basis of our own? Or of Caesar Augustus' pax romana, an unparelled 200-year period of peace and prosperity? There was a glimmer of hope when he journeyed to Calabria in January to inaugurate the first direct flight from Kennedy Airport to the southern Italian airport of Lamezia Terme. But it was quickly dashed with the failure of Giuliani's staff to ballyhoo the trip or underscore its significance. Instead, we hear this: When asked about his wife Judith's role in a Giuliani administration, he couldn't resist reverting to form: "I am a candidate. She's a civilian, to use the old Mafia distinction." When queried about Hillary Clinton's vile Internet spoof of the "Sopranos" finale, he responded with a question of his own: "Think she's trying to get the Mafia vote?" Peggy Noonan, one of President Ronald Reagan's favorite speechwriters and a New Yorker to the bone, has a wry take on these tawdry proceedings: "Can't have enough candidates for president who whimsically employ the language of mobsters." Mario Cuomo, a man who surely missed his rendezvous with destiny, knows full well the dangers posed by anti-Italian intolerance. He witnessed Geraldine Ferraro's trials as the Democratic vice presidential nominee in 1984. And the New York former governor was famously smeared as likely having "mafioso connections" by Gennifer Flowers (Bill Clinton's trailer-park paramour). "Treat with utmost respect your power of forming opinions, for this power alone guards you against making assumptions that are contrary to nature and judgments that overthrow the rule of reason. It enables you to learn from experience, to live in harmony with others, and to walk in the way of the gods." Thanks to Rosario A. Iaconis, the vice chairman of The Italic Institute of America, which promotes Italian culture and is based in Floral Park.